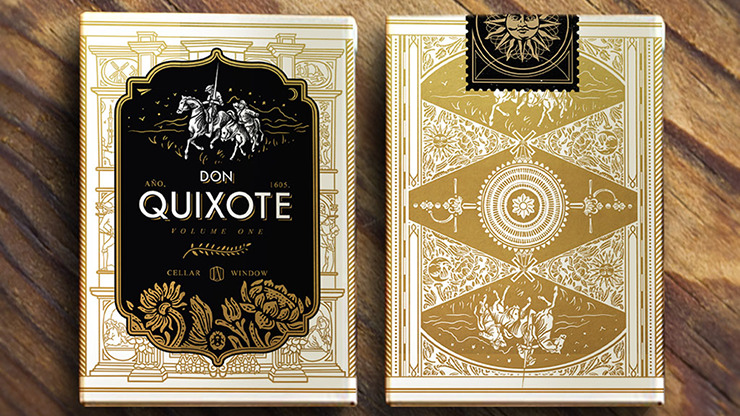 The Don Quixote - Volume One deck of playing cards was designed and custom-illustrated by Nam Tibon, from design studio Cellar Window. It was created as a homage to the 400th anniversary of the death of Spanish novelist Miguel Cervantes, author of the famous novel Don Quixote, the full title being "The Ingenious Gentleman Don Quixote of La Mancha". 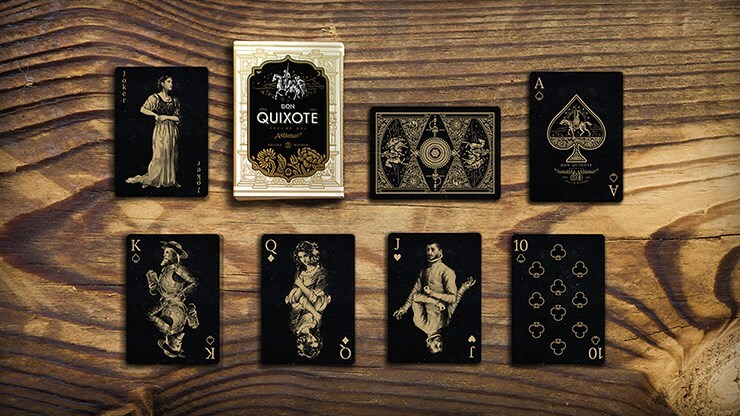 The first part of a two volume set of decks, it illustrates the characters of the novel and gives a glimpse of their lives, with the first deck corresponding to characters that the Hidalgo Don Quixote meets during his travels as a knight errant through Spain in the first volume of the novel. The tuck box features a gold/copper style foil, with the back of the box being particularly stunning and impressive. This is one of the nicest boxes I've seen, and I especially love the effect of the matt black used on the front, with the foil lettering, which creates a very elegant and stylish look. 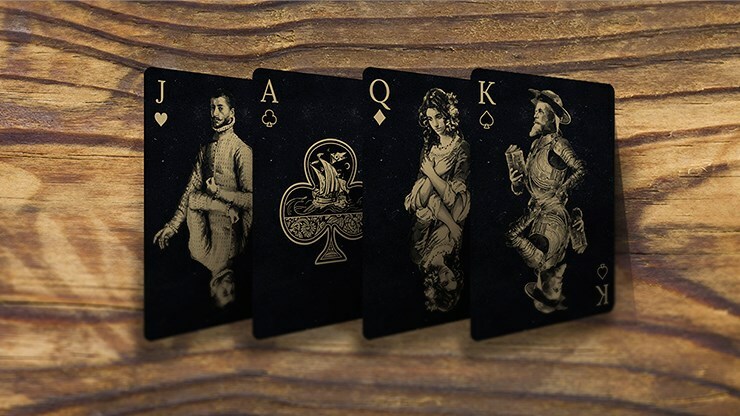 The card backs features Sancho and the Don, while all the card faces in the deck are black, with beige coloured illustrations. The use of just two colours, just beige and black, results in a very elegant and artistic feel. The level of detail is fitting, given the enduring reputation of a novel that has stood the test of time. The Dom deck is white with black cards, with a deliberately scratchy/worn look. 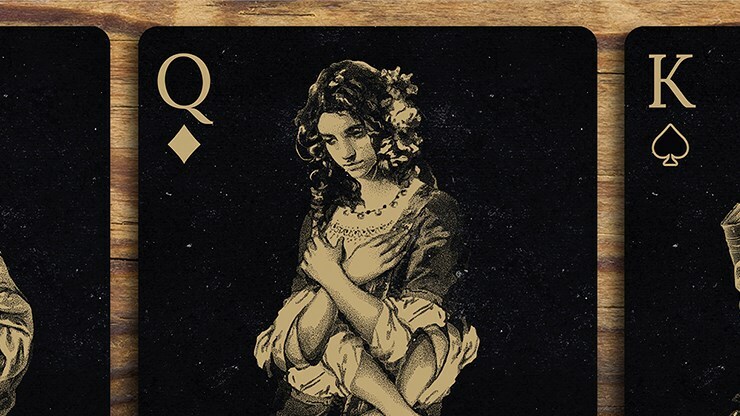 Unfortunately these weren't printed quite as consistently as I'd like in a black deck, and the card-backs even seemed to have some white spots - it seems to be part of the design and so the cards aren't marked, but in my view it takes away from the elegance of the deck. 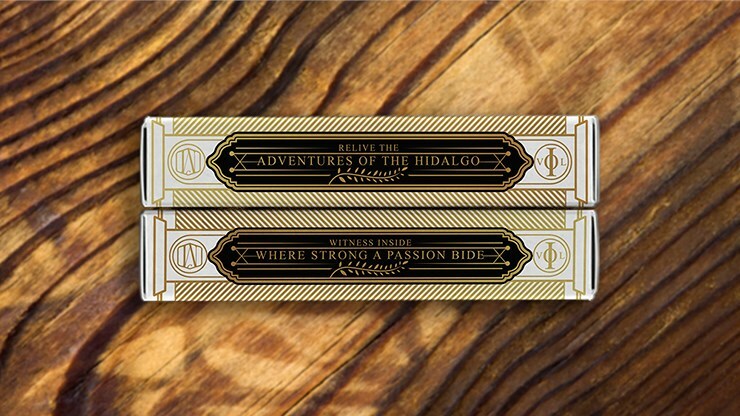 A matching Hidalgo deck that printed subsequently has a reversed colour scheme of black tuck box and white cards. 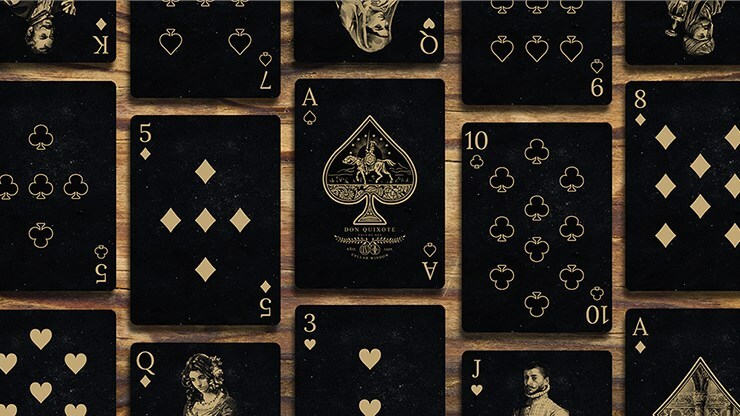 The cards were printed by Legends Playing Card Company in their Diamond finish, which is slightly thinner than a standard Bicycle deck, but more durable, and has a great snap making them ideal for springing and handling. A nice deck with an outstanding tuck box, but the black cards didn't work out as nicely as I was hoping for.